The name of the species mairei is due to the Latinized name of Maire, in memory of a famous French Mycologist of the last century: René Charles Joseph Ernest Maire (1878-1949). The section Russula includes carpophores of rather small and frail size, having a more or less bright cap, white stem, without veil, and the flesh with a peppery, normally very strong, taste. The spore print goes from the white to the dark yellow, with presence of pluri-septum or unicellular dermatocystidia but very well characterized, normally bare, only in few species they may be found encrusted. Cap: 4-6 cm, convex, finally also little depressed, with a fleshy texture, smooth margin, usually without grooves but later; detachable cuticle for half of the radius, bright, of red colour, at times partly decoloured to cream, ivory cream. Gills: attenuate, frail, white, with glaucous reflections at times. Stem: robust, rugged, with rigid bark and stuffed inside, of white colour tending to get dirty of brown ochre with the age. Flesh: firm, white, at times somewhat yellowish, smelling like coconut and very peppery flavour. Chemical reactions: Guaiacum positive; Ammonia negative; Aniline, on the gills, rust orange. 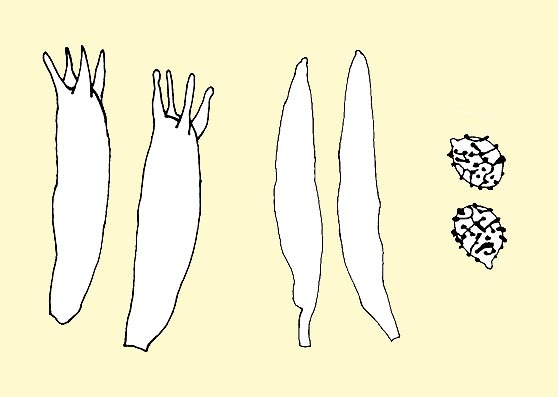 Spores: 6,6-8,5 × 5,6-6,7µm, obovoid, with warts connected by ridges or connecting lines forming a reticle, little amyloid supra-hyphal notch. White spore print, first of the Romagnesi code. Epicutis formed by very thin hairs, 4-5 µm, attenuate, with pluri-septum, cylindroid, dermatocystidia. Habitat: it grows in the deciduous woods, particularly in the beeches. Edibility: not edible due to its pungency. Remarks. This species is characterized for its medium-small size, the cylindrical stem, short and stocky, for its flesh of hard consistency, for its almost immediate reaction to the Guaiacum and for its growth in the beech. It may be mistaken with: Russula silvestris, which may be defined as a perfect double, but with, anyway, a negative reaction to the Guaiacum, the slightly bigger spores with great warts; Russula persicina, which has the stem often pigmented of red pink and the cream spore print giving to the gills of the ripen fungus a yellowish reflex; Russula luteotacta, has the gills tending to be decurrent and spaced, the flesh staining of yellow in the eroded parts; Russula rhodomelanea, growing in the warm oak forests, with more spaced gills and the flesh tending to the blackish grey when dehydrating. 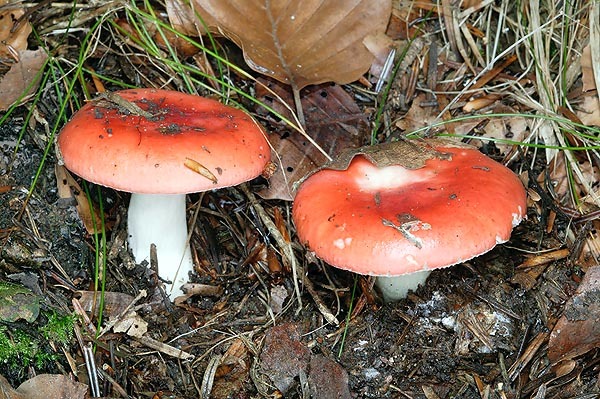 Synonyms: Russula fageticola Melzer ex S. Lundell 1956; Russula mairei var. fageticola Romagnesi. → For general notions about Fungi please click here. → To appreciate the biodiversity of MUSHROOMS please click here.